About Rheology Modifiers | Chemical Coatings | SNP Inc. The figure shown illustrates the parameters of the viscosity term and provides the calculation used to obtain its value. The rheological behavior of materials can be described as either elastic or viscous in nature. Elastic describes materials that are ridged or solid-like in their behavior. This means that when a stress is applied, the internal forces remain intact so the energy applied is stored and when it is released the structure completely recovers to its original form. Viscous describes materials that are fluid like. This means that when a stress is applied, the material readily flows due to the lack of internal forces being present to resist flow. So for these materials, viscosity is independent of shear rate. All energy put into the system is dissipated as heat and is lost. An ideal Newtonian liquid, such as water, is a good example of this. Most polymers, synthetic or natural, will exhibit both of these rheological properties and are best described as being viscoelastic. The viscous and elastic contribution of materials depends upon the type and strength of internal structures present. 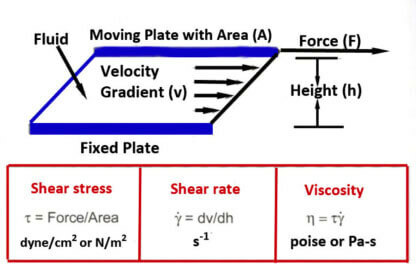 Therefore, the rheological response of a viscoelastic material to shear depends on the stresses applied, the duration of deformation, and physical conditions under which they are applied. This is especially true when working with roll, brush, spray, jet and fountain applicators. When applying a coating, a shear force is always applied in some form, which subsequently deforms the coating. The applied force can be in the form of shear from a brush or roller during painting or blade or rod on a paper machine coater. Regardless of the application or metering process, immediate coating recovery is essential for good film formation (uniformity). Coatings typically need to be shear thinning, but must also recover quickly before the ink on coating sets to prevent patterning. It is also important to maintain coating structure to prevent product settling over time. Most water-borne coatings will use either a synthetic or natural rheology modifier to achieve this balance of good coating performance and storage stability.